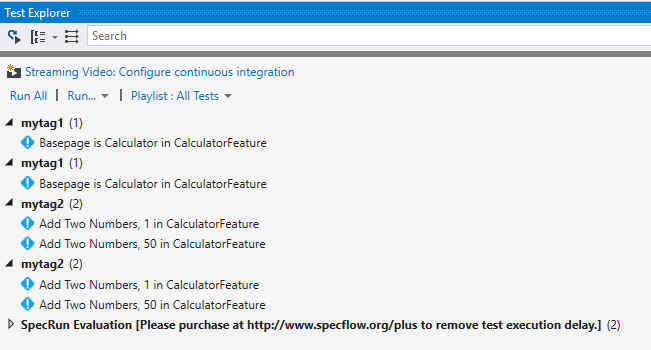 This is not a blocker, but since upgrading SpecFlow from 2.1.0 to 2.2.0 and SpecRun 1.5.2 to 1.6.0 I've noticed that when tests are grouped by "Traits" in Test Explorer they are duplicated/doubled up (see attached screenshot). I think it may be due to having both SpecRun.SpecFlow v1.6.0 & SpecRun.SpecFlow.2-2-0 v1.6.0, but they seem to have been added by NuGet automatically. Do I need both? which is the "correct" one to have? What do you have configured as unitTestProvider in you app.config? Do you have this behavior in every project or only in this one? 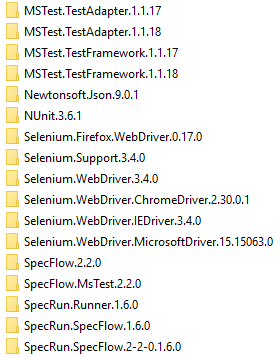 Could you check your packages folder, if there are multiple versions of the SpecRun.Runner package. I have this problem in diffrent projects and only one SpecRun.Runner.1.6.0. I have 2 projects in 1 solution. Both projects have this problems. Could you try one of the examples from https://github.com/techtalk/SpecFlow.Plus.Examples and see if there you also have duplicated tests? Have tried with "CustomDeploymentSteps --> CalculatorFeature". However when I upgrade to the latest versions then with unitTestProvider 'SpecRun' no tests are being shown in Test Explorer. I can reproduce the behaviour and will have a look at it. I found the error and I am working on a fix. This is fixed and will be released with the next release of the runner. Great. Thanks for working on this. When do you anticipate the next release? Will test soon after the next release. SpecFlow+Runner 2.2.1 is released which include the fix for this issue. [22/09/2017 09:31:52 Informational] SpecRun Evaluation Mode: Please purchase at http://www.specflow.org/plus to remove test execution delay. [22/09/2017 09:31:52 Informational] System.Runtime.Serialization.SerializationException: Type is not resolved for member 'TechTalk.SpecRun.Framework.Remoting.RemoteDomainInitializer,TechTalk.SpecRun.Framework.Utils, Version=1.6.0.0, Culture=neutral, PublicKeyToken=null'. [22/09/2017 09:31:52 Error] An exception occurred while test discoverer 'SpecRunTestDiscoverer' was loading tests. Exception: Type is not resolved for member 'TechTalk.SpecRun.Framework.Remoting.RemoteDomainInitializer,TechTalk.SpecRun.Framework.Utils, Version=1.6.0.0, Culture=neutral, PublicKeyToken=null'. Seems to have some reference to v1.6.0 stuck somewhere? 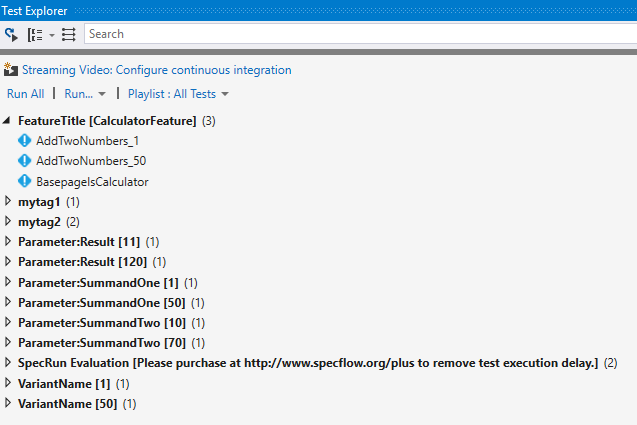 Also no tests are shown in Test Explorer if I just use Specflow, but if I use the MSTest UnitTestProvder then tests are shown. Note: I have 3 Specflow projects under the same solution. @realfaisalk This has nothing todo with this issue. Please open a new one. Apologies, I thought it might be something to do with the fix from this issue, but it looks like it was just Visual Studio playing up. Had to completely remove my projects and re-download them from TFS. 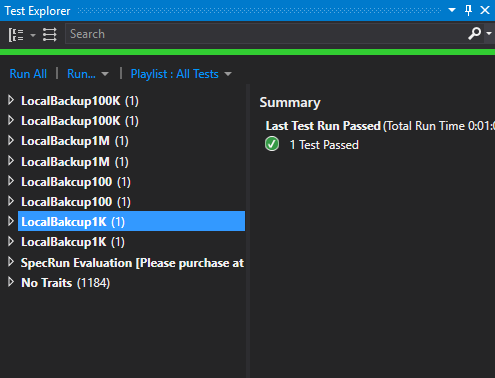 **Can confirm that the duplication has gone now and tests are displayed correctly in Test Explorer.